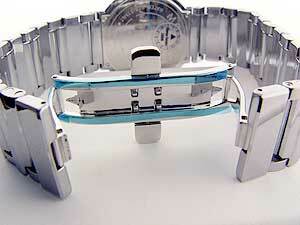 Watch buckles and clasps come in many different styles and configurations. It would be impossible to list and display all of them, so we have attempted to describe in some detail the main types as well as provide some definition to the terms. 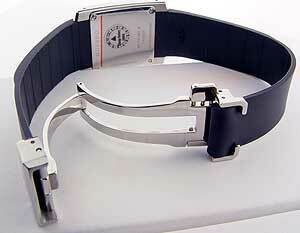 If you have a question about a buckle on any particular watch, please do not hesitate to contact us. 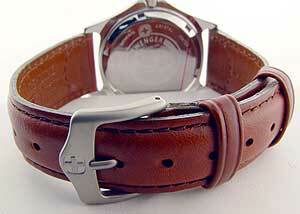 The terms clasp and buckle are mostly interchangeable. 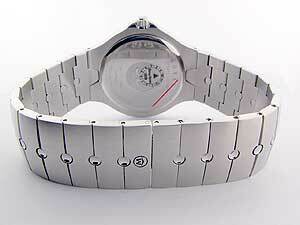 Buckle usually refers to the strap type band while a clasp is usually associated with a metal bracelet. However, we will use the terms interchangeably here. 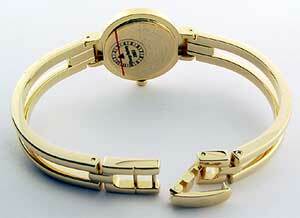 It is the part of the watch that either opens or separates allowing the watch to fit around the hand. Typically, the buckle then is latched together in some form. A deployment clasp is the type where the clasp opens out and folds. It locks in place with a small hook type latch. 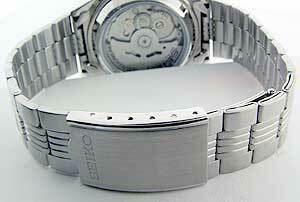 In this example we are looking at a Seiko 5 Automatic watch. 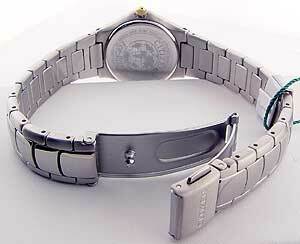 The clasp then folds out in to thirds allowing the watch to fit over the hand. A pushbutton deployment clasp is the same as a regular deployment clasp, however in order for it to be released, you must pinch the buttons on either side of the clasp. 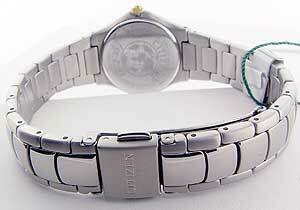 In this example we are looking at a Ladies Citizen Titanium Corso. The pushbutton is a security feature so that the clasp will not open on its own. 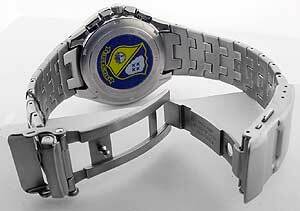 Some watches like the Citizen Titanium Skyhawk have two security features. 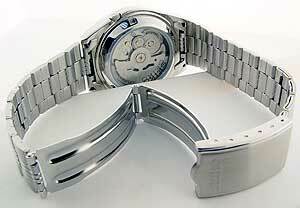 This model has a fold-over snapping latch that secures the whole clasp as well as having the pushbutton feature. The fold-over latch is first flipped out allowing the claps to be deployed by pushing in the buttons on either side. 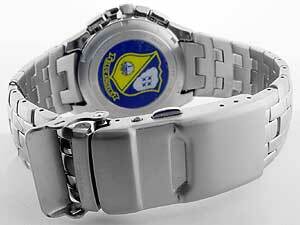 The bracelet is then extended to its full size to fit over the hand. A hidden deployment clasp is the type where the clasp is invisible when it is being worn. The ends of the bracelet come together to meet so that none of the clasp shows. This is done to help the appearance. 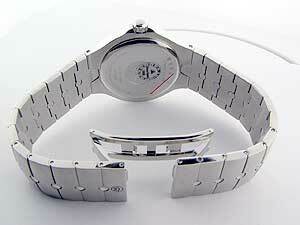 In this example we are showing a Movado Men's Sport Edition watch. These types of clasps are sometimes referred to as butterfly clasps because they open on both sides characteristic of a butterfly's wings. 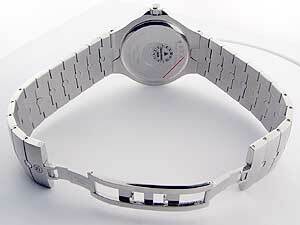 The bracelet is then extended to its maximum length. Some hidden deployment clasps have pushbutton release mechanisms on them for added security. Such is the case with this Movado Valor. A jewelry clasp is the simplest of all clasps. It is a latch that snaps closed around a bar. 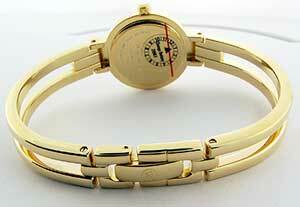 Shown here is a Movado Ladies Harmony. It is released by gently lifting the clasp and unsnapping it from the latch bar. A strap buckle is a simple pin system that hold a strap in place by being secured through one of a series of holes in the strap. This is also common on many belts. Show here is a Wenger Avalanche. Some straps have special deployment type clasps attached to them. 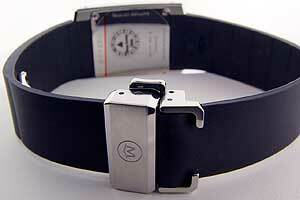 This Movado Strap Eliro has a rubber strap that has a pushbutton deployment clasp attached to it for easy removal. 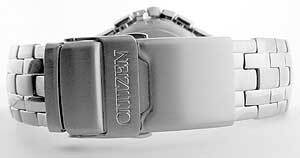 The clasp also allows the strap to be pulled through allowing for a perfect fit for the wearer.